Any and all content, words, phrases, images, photos, illustrations, names, trademarks, copyrights, trade dress, look, feel and indicia are the sole and exclusive property of Charles Atlas, Ltd and any and all use is prohibited without the written permission of Charles Atlas, Ltd. The words and phrases "Atlas®," "Charles Atlas®," "Dynamic-Tension®," , "Atlas Nutrition®," "Mr. Atlas®," "The World's Most Perfectly Developed Man," "97-pound weakling," "Insult that Made a Man Out of Mac®," "Hero of the Beach," "Scrawny to Brawny,"Hey Skinny®," "the comic strip featured as well as the photographs and text are all trademarks of Charles Atlas Atlas, Ltd. The “Charles Atlas®” “Dynamic-Tension®” method, system, philosophy and principles are the sole and exclusive property of Charles Atlas, Ltd. Any and all use of the course, reproduction, copy and/or dissemination is prohibited without the written permission of Charles Atlas, Ltd. All copyrights, trademarks and service marks are registered and protected by the Federal Government of the U.S.A. and the Berne Convention. Charles Atlas, Ltd. and its affiliated companies “Atlas Nutrition, Inc.” and “Charles Atlas Health and Fitness, LLC.” is active in licensing the trademarks and images to “Fortune 500” companies and major retail companies all over the world. The company has been active in licensing the trademarks and images to fortune 500 companies as well as major retail companies all over the wolrd. NO ONE PICKS ON A STRONG MAN! "The World''s Most Perfectly Developed Man"
Click on the images below to see a largerl size pdf file. "Fit to Walk and Talk"
These are a few of the many companies that have used Charles Atlas licensing. 1. IBM - used name "Charles Atlas" in a major PRINT AD CAMPAIGN showing the power of the IBM web hosting service..."THE CHARLES ATLAS SCHOOL OF WEB HOSTING!" 2. The GAP - over 210 GAP STORES (in USA, FRANCE, UK, and GERMANY) had full life size posters of Charles Atlas in their windows and within the stores, using Mr. Atlas as The Model promoting the Gap Body Store. 3. American Greeting/Hallmark - Greeting Card with Atlas on it. 5. "Fit to Walk and Talk" - A new fitness book features Mr. Atlas and Atlas Ads as inspiration for getting fit in Australia. 6. A new Hip Hop group (The Renegades) of Minneapolis produced and published a song entitled, "Charles Atlas!" to use in a program about John Wooton. 8. Discovery Channel Show on Bodybuilding on aired a segment about Mr. Atlas being the forefront of the fitness industry! 9. A&E Biography aired for the 3rd time, "CHARLES ATLAS : MODERN DAY HERCULES" in both English and Spanish! 10. Texas Elementary Principal and Supervisor's Association used Mr. Atlas Image to promote it's plan for Stronger Education for School districts in Texas at a convention. State of Texas - Texas Department of Tourism did a whole campaign on Texas beaches around our classic Charles Atlas ads. Writing Arguments". 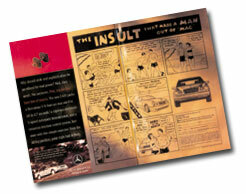 The book uses an Atlas advertisement, "How Joe's Body Went From Shame to Fame!" ad illustration! 14. Jensen Audio - Two Ads for their boat radios appeared In Boating Magazine. o The title line exploits the grammatical ambiguity of Atlas's slogan" In just seven days, I can make you a man," between the meanings ". . . cause you to become a 'real' man" and ". . . create a man for you." o It mentions both Charles Atlas®” and "Dynamic-Tension®" by name. o The second line references the Charles Atlas® advertising campaign with "Will get sand in his face when kicked to the ground." o The mad-scientist character (Dr. Frank N. Furter) furthermore claims that his Frankensteinian creation "carries the Charles Atlas® Seal of Approval." The Who song "I Can't Reach You", featured on the album The Who Sell Out, is preceded by a "commercial" for the Charles Atlas® Course. ("The Charles Atlas® course with "Dynamic Tension®" can turn you into a beast of a man.") John Entwistle poses on the cover as a panther skin-clad Charles Atlas® alumnus, as the more muscular Roger Daltrey was otherwise occupied in a bathtub filled with baked beans. The song "Mr. Apollo," recorded by the Bonzo Dog Doo-Dah Band and released on the album Tadpoles, parodies Charles Atlas®'s advertising, with lead-singer/writer Vivian Stanshall affecting a gruff butch voice. The song involves members of the band singing the praises of fictional bodybuilder Mr Apollo, while Stanshall alternately sings and offers no-nonsense motivational advice, such as "no tiresome exercises / no tricks / no unpleasant bending / wrestle poodles and win!" The song "I Will Not Fall" By Wiretrain/Wire quote is; "And Charles Atlas Stands, upon the beach, upon his head and says . . . I will not fall." The band A.F.I. have a song called "Charles Atlas" on their album "Very Proud Of Ya." The Bob Dylan song "She's Your Lover Now" contains the lyric: "Why must I fall into this sadness? / Do I look like Charles Atlas? / Do you think I still got what you still got, baby?" The Josef K song "Sorry For Laughing" contains the lyric: "When we groove on into town / Charles Atlas, he stops to frown." Roger Waters' song "Sunset Strip," (from Radio KAOS) contains the line "I like riding in my Uncle's car / Down to the beach where the pretty girls all parade / And movie stars and paparazzi play the Charles Atlas kicking-sand-in-the-face game." The title song of the 1964 film Muscle Beach Party features the lyric "Cherry little woodies are the center of attention / Til the muscle men start the "Dynamic-Tension"
The Propaganda song "Sorry For Laughing" contains the line "when we grooved on into town / Charles Atlas stopped to frown / cause he's not made like me and you"
The 1990 film Book of Love has Tom Platz playing a Charles Atlas-like character. The British comedy troupe Monty Python created a cartoon (animated by Terry Gilliam) of the famous beach advertisement. In the Futurama episode "When Aliens Attack," Fry gets sand kicked in his face by a "professional beach bully" who asks for payment for his services after Fry has won the girl, Leela. Leela hits on the bully. The 1975 film "Rocky Horror Picture Show" makes references to Atlas. In an episode of That 70's Show, Eric's sister accuses him of being weak by saying he ordered a Charles Atlas video to buff up. The novel Cat's Cradle, written by Kurt Vonnegut Jr., mentions Charles Atlas. When the narrator comes across the term "Dynamic Tension" in a book about the mysterious cult leader Bokonon, he laughs because he imagines the author does not know "that the term was one vulgarised by Charles Atlas, a mail-order muscle-builder." However, as he reads on he finds that Bokonon is an alumnus of Atlas's training program, which has inspired his idea that "good societies could be built only by pitting good against evil, and by keeping the tension between the two high at all times." The fictional short story "Charles Atlas Also Dies" by Sergio Ramirez, centers around the main character—a follower of Atlas's exercise program—and his trip to America to meet Charles Atlas himself; written from an ironic and dark-humored perspective. Among the numerous references to Atlas's program/story/advertisements, the main character describes having sand kicked in his face by "two big hefty guys" in front of his girlfriend, and later being compared to the mythological god Atlas after undergoing the program. ]The story juxtaposes the superhuman strength and notoriety of Charles Atlas—the symbol, with the fragile and mortal aspects of Charles Atlas—the man. The story begins with the quote: "Charles Atlas swears that sand story is true. - Edwin Pope, The Miami Herald. In an issue of the DC Comics title Mystery in Space, the main character Comet, referring to an army of super-powered clones, says "Physically those clones may make me look like a 98-pound-weakling, but psychically I'm the Charles Atlas of this beach." "NOBODY PICKS ON A STRONG MAN!" "The World's Most Perfectly Developed Man."